Be the first to share your favorite memory, photo or story of Milford "Skip". This memorial page is dedicated for family, friends and future generations to celebrate the life of their loved one. 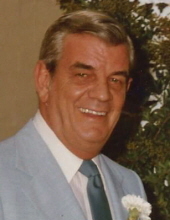 Milford “Skip” Lyle Eberly, 86, passed away Monday, April 1, 2019 at Rennes East, Peshtigo. Skip was born June 11, 1932 in LanCaster, PA to the late Charles and Almeda (Chittister) Eberly. Skip attended high school in Depew, NY. After graduating he gained employment with America Airline, which was interrupted when he went into the military. Skip served two years in South Korea. After returning, Skip continued with American Airlines for forty five years until he retired and moved to Oconto, WI. Skip enjoyed spending time with his seventeen grandchildren and nineteen great grandchildren. Skip will be dearly missed. Skip is survived by his wife of thirty four years, Joyce (Makos) Eberly, Oconto; son, Kent Eberly, Mesa, AZ; step-children, Michael Daul, Oconto; Peggy Rhode, Pound; Ronnie Daul, Oconto; Francis (Tony) Daul, Oconto; JoAnn Resch, Appleton; James Daul, Oconto. He was preceded in death by a son, Kurt Eberly; step-children, Pastor Charles Daul; John (Jay) Daul, Susie Daul. A special thank you to the staff at Rennes East and Heartland Hospice. The Gallagher Funeral Home, Oconto, is assisting the family. Online condolences may be expressed at www.gallagherfuneralhome.net. To send flowers or a remembrance gift to the family of Milford "Skip" L. Eberly, please visit our Tribute Store. "Email Address" would like to share the life celebration of Milford "Skip" L. Eberly. Click on the "link" to go to share a favorite memory or leave a condolence message for the family.